SURFSET was born in the US when Mike Hartwick, a former professional hockey player, realised that surfing daily in California during off-season gave him even better results in his physique and sport performance than his regular heavy-weight workouts in the gym during hockey season. He decided to design a machine to mimic the workout that he got while surfing. With his partners Sarah Ponn and Bill Ninteau, Mike invented the world’s first total-body surf trainer, designed to simulate the physical demands of surfing without the ocean. Together, they have developed a unique workout program using the SURFSET board that everyone can use to get in surfer shape without even getting wet! 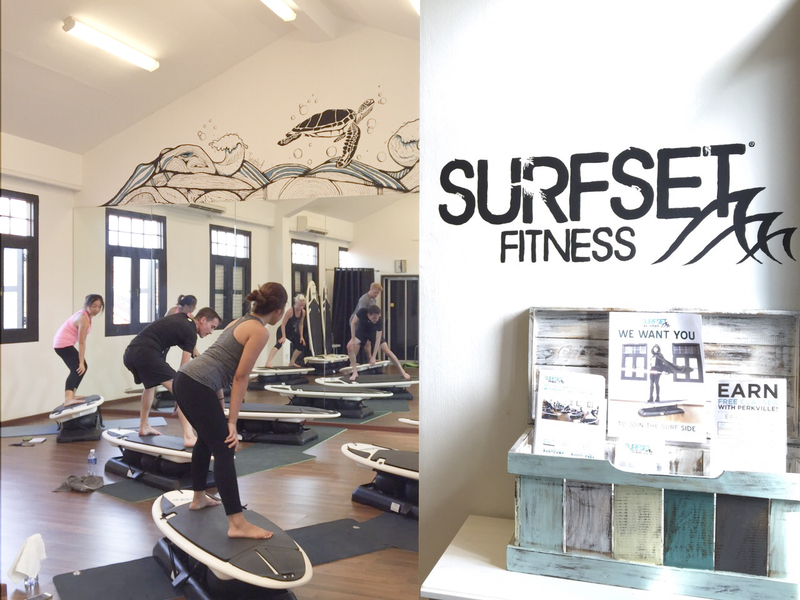 SURFSET Fitness Singapore is Asia’s first studio offering the unique SURFSET Fitness programme, and we’re proud to bring this exciting, one-of-a-kind workout to the sunny island of Singapore. We can run classes of up to 12 participants, and participants can use the changing rooms, showers, and washroom facilities of the Singapore Sports Hub Gym. Our classes are conveniently held at the Fitness Studio at OCBC Arena, Singapore Sports Hub (Level 2, near the Gym). 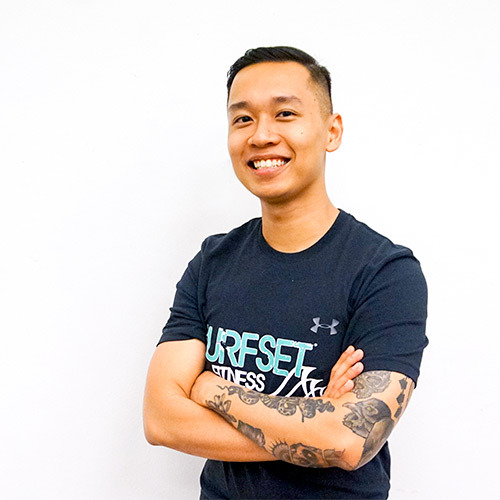 SURFSET Fitness Singapore aims to promotes a healthy, balanced active lifestyle through unique exercises that are challenging, fun, and safe. We’ve been featured in Singapore’s hottest magazines, radio stations, and TV – read more at our Media Mentions page. Shuyi & board sports go together like peanut butter & jelly. After snowboarding down the Austrian alps, surfing in Bali and wakeboarding the Singapore Straits, she’s found her favourite board… the SURFSET RipsurferX! 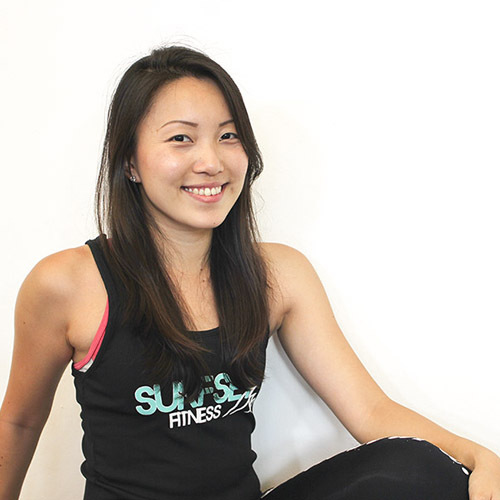 As a PT and yoga instructor, Shuyi is passionate about incorporating a wide spectrum of different elements into her classes, and she loves the unstable dimension and the added challenge that the SURFSET board provides! As a new mom, she also loves how SURFSET gets her back into shape. Sports and fitness have surrounded Wany all her life, but she’s never been a water baby. Somehow, she still found love in SUP on a trip to the Maldives, and that led to surfing and snowboarding. Now she’s found her preferred workout – surfing on land! A Nike Training Club trainer, an established Pilates instructor, and all-round fitness hottie, Wany’s sure to bring about some firecrackin’ fun into her classes! The open sea and great outdoors are Ashley’s happy places. It all began in her school days when she spent many sunny hours kayaking around islands, windsurfing and rock-climbing. Now mama to a toddler boy, she looks forward to the day they can go on a family dive or mountaineering adventure together. In the meantime, SURFSET provides her with that additional boost of endorphins. Ash is also a passionate Pilates practitioner and loves how RipsurferX challenges her core and balance. Stephanie has been an active athlete since young and has developed an interest in functional training, especially after trying to heal her ACL injury years ago. In her journey to regain full use of her knees, she discovered yoga, and soon she found how her overall fitness improved by practicing various types of exercises, sports, and training. 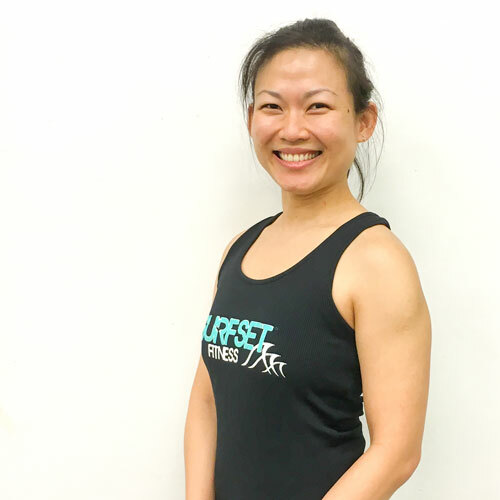 Now, she’s a happy camper with SURFSET Fitness, where she can get a fantastic combination of cardiovascular and core muscle workout in a single regime – and more importantly – she can help others achieve their health goals with an amazing SURFSET workout! An avid Sports Science nerd, Gaz loves dabbling in all things fitness. From Yoga to Barre, Marathons to Triathlons, Boxing to Powerlifting. But he has never found a better way to synergistically develop balance, core strength, and cardiovascular endurance than through SURFSET, all while having a ton of fun! When he’s not chasing his daily endorphin fix, you’ll probably find Gaz taking long beach walks with his dogs, or making questionable choices at local tattoo parlours. We just know that you’re gonna love your first experience on the SURFSET board! All you need to bring is a positive attitude, a towel and a water bottle. Wear something comfortable, similar to what you would wear to a Yoga or Pilates class. We recommend tight fitting pants or shorts, to avoid tripping when popping up on the board. No shoes necessary (we like to keep it authentic!). Our instructors will guide you along for the 45 minute session. You don’t have to worry about your level of balance and fitness – our instructors will be able to adjust the difficulty level for you, and implement progression for you to quickly be proficient on the board. Likewise, if we see that you are really getting comfortable moving on the board, we will introduce advanced moves to further challenge you! Our SURFSET Fitness classes are held at OCBC Arena, Singapore Sports Hub. For more information, check our contact page. Please come to the studio 15 minutes early to fill in your registration form and get changed. Participants can use the changing room, showers, and washroom of the Sports Hub gym. WILL SURFSET TEACH ME HOW TO SURF? Yes and no. Just as Spinning does not teach a person about road conditions and how to balance on a bike, SURFSET will not teach you the intricacies of how to choose waves and react to different situations in the ocean. However, both SURFSET Fitness and Spinning are great ways to condition the muscles that are required for its outdoor counterpart. In SURFSET Fitness, we do plenty of surfing motions (like paddling, pop-ups, carving and duck dives) that will improve your upper body strength, rotational strength and balance, all of which come into play during real-life surfing. CAN I USE THE SURFSET BOARD IF I HAVE NEVER SURFED? Yes! The Board is an awesome way to introduce your body to the movements of surfing. It may be a challenge for you to work on the most difficult setting, but you can start at a beginner level and work your way up as your balance, core strength & surfing muscle memory improve. CAN I USE THE SURFSET BOARD IF I AM NOT VERY FIT, OR HAVE NOT WORKED OUT IN A LONG TIME? Yes! The Board is adjustable for all levels, even for someone with less than ideal balance and a lower fitness level. The reason SURFSET Fitness was created was to inspire people who have been disillusioned and bored by other workouts. So, even if its been years since you’ve stuck with an exercise program, SURFSET Fitness will engage your body & mind to elevate your fitness. HOW IS THE SURFSET BOARD DIFFERENT FROM OTHER BALANCE TRAINERS, LIKE AN INDOBOARD OR A BOSU BALL? The Board is built with an actual custom-made surfboard, engineered to allow you to perform a wide array of traditional exercises with the added core benefit of working out on an unstable surface. Other balance trainers cannot truly mimic the workout of Surfing, as they are either too unstable, too small, or they do not provide the same shape and exact movement of a surfboard on water. The Board allows you to build aerobic conditioning, burn fat, build lean muscle, power, agility, stability & tone in addition to core & balance training. Other balance trainers can only claim 1-2 of these benefits. WHAT IF I HAVE AN INJURY OR IF I’M PREGNANT? We do not recommend that pregnant women or people with injuries to join our public group classes, as you have special exercise needs which we cannot address in a group setting. With that said, SURFSET Fitness is actually an excellent way to rehabilitate bad joints and tissue injury under the guidance and specialized attention from a professional, and can also be a great way for mums and mums-to-be to keep fit and healthy. We offer private sessions, customized to meet any special requirements and fitness level of every individual or group. Of course, consult your doctor first. Our SURFSET instructor Shuyi was teaching and exercising on the board during her pregnancy, all the way until she delivered! WHY IS SURFING SUCH A GOOD WORKOUT? Surfing is an extremely athletic sport. It works all major muscle groups in a dynamic environment that demands extreme focus & core strength. Cardio from paddling & explosive popup movements, isometric contractions of the legs to carve and control the board, and of course balance. If you look at a surfer’s physique you can see that the sport promotes long, lean muscle rather than the bulky body builder look. SURFSET Fitness draws on all of the movements of Surfing to bring the body benefits to you without the ocean. DOES USING THE SURFSET BOARD FEEL LIKE REAL SURFING? Yes! The Board was created to perfectly mimic the feeling & the physical demands of surfing. The unique side to side motion of the board feels just like floating atop the water on a surfboard, and allows you to train the same muscles as a surfer without the ocean. WHAT ARE THE DIFFERENCES BETWEEN SURFSET, YOGA AND PILATES? SURFSET differs greatly from the traditional exercises of Yoga and Pilates, and is a great complement to these workouts. Yoga is an ancient practice, or discipline, that originated in India, and comprises of spiritual, mental, and physical aspects. Yoga is generally an exercise of moving from one static posture to the next, with the participant having to be fully aware of each movement. The spiritual aspect of Yoga is also very important. Pilates is a form of exercise developed by Joseph Pilates in the 1920s. Pilates is a mind-body exercise that requires full knowledge, control, and awareness of every movement, and was inspired by movements in martial arts, yoga, and dance. Many Pilates exercises are done with specialized equipment and machines, such as the Pilates Reformer. SURFSET Fitness is very different in the sense that the exercise and movements are much more dynamic and fluid, with less focus on the spiritual aspect and less on understanding the motions of each movement. SURFSET really isn’t about putting your body into complex positions to work your body – it’s about functional training using natural, comfortable movements, combined with an unstable base, to build up core strength and balance. In the same way, SURFSET provides the benefits of improving your core and building a leaner, better body, all together with a great cardio workout and lots of fun. SURFSET can be safely practiced by Yoga and Pilates practitioners as part of their workout routine. In fact, our SURFSET instructors are themselves ardent practitioners of both forms of exercise, and many of them are qualified instructors of Yoga and Pilates. We do offer off-the-board Yoga classes. HOW MANY TIMES A WEEK SHOULD I TAKE SURFSET CLASSES? SURFSET Fitness is a truly comprehensive full body workout that covers all of the fitness bases and you can do it 5-6 times a week if you’d like! Of course its always beneficial to shake up your exercise routine and incorporate a few different style workouts, so its definitely up to you how many SURFSET Fitness classes you’d like to take. We like doing at least 2 to 3 classes a week to see quick results. HOW MANY CLASSES UNTIL I START SEEING RESULTS? You will start seeing & feeling results after just 2 classes. The most pronounced results are firming of the triceps/upper arm & tightening of the core & sides. And you will see how quickly your balance & SURFSET skills improve within the 1st week! HOW MANY CALORIES DOES A SURFSET FITNESS CLASS BURN? It depends on your size & body composition, we have had ranges from 400 per class to 900 per class, with a 60 kg (~140 pound) woman burning on average 500 per class. And don’t forget that you are building lean muscle, which accelerates your calorie burn & increases your metabolism throughout the day. So even when you finish class and sit down in the car you are burning more calories than usual. This is why strength training is so beneficial! WHAT SHOULD I WEAR TO A SURFSET FITNESS CLASS? Wear something comfortable, similar to what you would wear to a Yoga/Pilates/Aerobics class. We recommend tight fitting pants or shorts, so as to avoid tripping when popping up on the board. No shoes necessary (we like to keep it authentic!). Please bring a towel as well. Yes, reservations are required as classes need a minimum of 2 participants to run. Classes without the required number of participants will be cancelled 3 hours before class start time. However, you can call us as late as 30 minutes before scheduled class times to find out if there’s a board available for you. HOW DO YOU KEEP THE BOARDS CLEAN? The boards are made from anti-microbial foam. After each class, we get participants to wipe down their boards with a natural disinfecting spray. In addition, boards are thoroughly disinfected by our staff at the end of each day.